While gold prices continue to languish in the doldrums and are on course for their worst month since 2013, global demand and especially Chinese retail, investor and official demand continues to remain very robust. 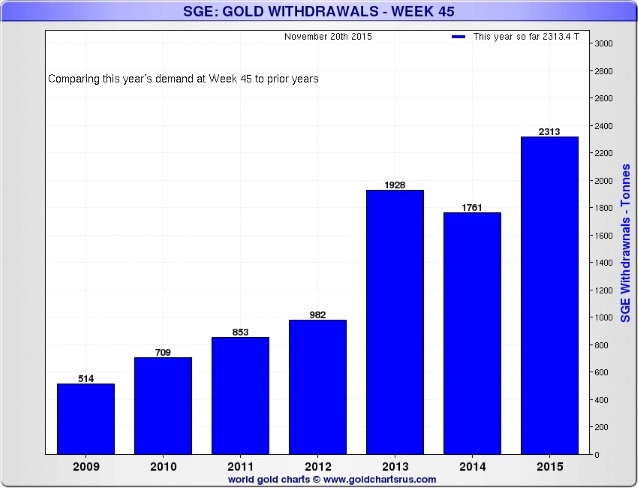 Indeed, China looks likely to see a new record demand for gold annually again in 2015. Shanghai Gold Exchange (SGE) deliveries as reported last Friday were again very robust with another 54.063 tonnes of bullion deliveries for the week ending November 20th. 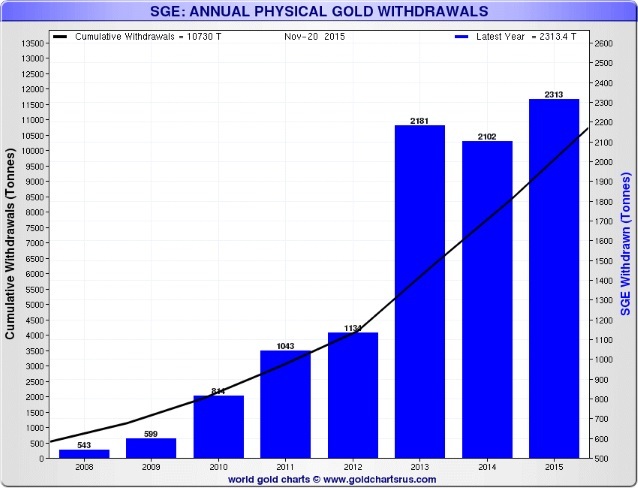 Shanghai Gold Exchange (SGE) deliveries remain the best indicator or proxy for actual Chinese demand and appear to show Chinese gold demand is heading for a new record in 2015 (see charts below). 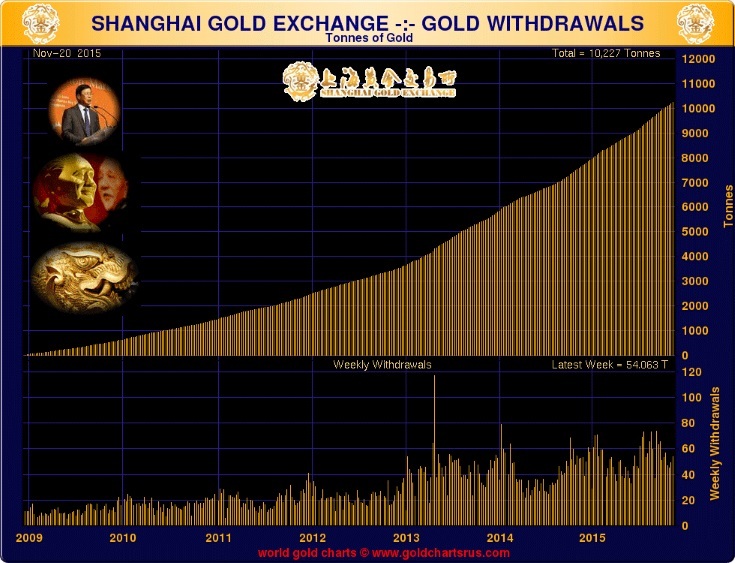 China added another 14 tonnes or 450,000 troy ounces of gold bullion to its foreign exchange reserves in October. Gold reserves rose to 1,722.5 metric tonnes or 55.38 million troy ounces at the end of October. This was up from 54.93 million at the end of September, data from the People’s Bank of China (PBOC) showed today. China’s increasingly powerful central bank has been adding between 14 tonnes and 19 tonnes of gold every month. The strong demand and positive view of gold comes as the country looks to diversify its massive foreign exchange reserves of over $3.5 trillion. China’s diversification into gold was again healthy and robust in ounce or weight terms but remains small in dollars terms at just $477 million at today’s prices – 0.00136% of fx reserves or 1.6% of fx reserves on an annualised basis. China’s sharp devaluation of the yuan this summer sparked another gold bar and coin “buying spree” in China according to the World Gold Council in their recent Gold Demand Trends report. Prudent Chinese store of wealth buyers are again protecting their wealth from volatility and sharp falls in stock markets and indeed in some property markets. Contrary to the widely held belief that gold bullion demand is subdued, it is actually very robust and, indeed, surging in key markets such as China. Data shows that surging demand for coins and bars and a rise in buying by central banks pushed physical gold demand up 7% in the third quarter. Demand for gold coins and bars jumped by 26% year-on-year in the last quarter, GFMS analysts at Thomson Reuters reported in the Q3 update of their Gold Survey 2015. Retail investment surged in top buyers China, India and Germany – rising 26 percent, 30 percent and 19 percent respectively. Those three markets alone accounted for an additional 26 tonnes of bullion buying. This data was confirmed by the World Gold Council. Their data shows global investment demand saw a significant rise of 27% to 230 tonnes, up from 181 tonnes in Q3 2014. Overall demand increased by 8% year-on-year to 1,121 tonnes as selling of futures contracts and ETFs contributed to a price dip, 6% in July, which buoyed gold bullion demand around the world. Another example of how large concentrated liquidations in the futures market on the COMEX is for the moment leading to lower prices – artificially so – was seen in trading on Friday after the Thanksgiving holiday on Thursday. 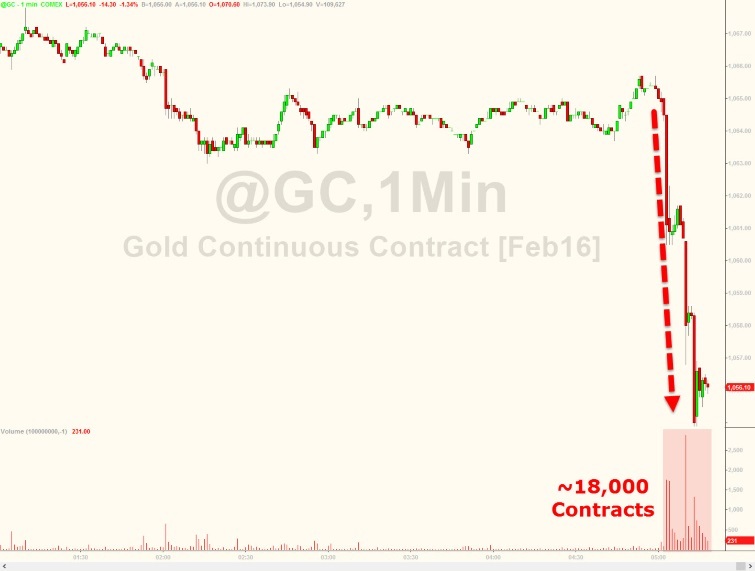 More peculiar trading on the COMEX was seen when 18,000 gold futures contracts, worth nearly $2 billion, were dumped on the market at a time when the market was less liquid (See chart). The nature of the selling again appeared to suggest that the seller may not have a profit motive in mind. The selling did both psychological and technical damage to gold. Gold sentiment already battered will not have been helped by the move and technically gold prices have fallen below what Goldman Sachs and others see as a “crucial level” technically. As has been the case on a number of occasions in the course of gold’s bull market, gold prices are ignoring positive real world physical supply and demand factors as the futures market wags the tail of the gold dog. We expect very robust Chinese and global bullion demand to bark soon and re-assert themselves and speculative players short the market may incur a nasty bite as will those with no allocation to physical bullion. The deterioration in the fundamentals of the global economy are so important that the Fed are suggesting that they will increase interest rates. Despite this, all eyes are again on the Fed and the possibility of a meager 0.25% interest rate rise. The Fed has been suggesting that this would happen for many months and, as ever, it is always best to watch what they do rather than what they say. Ignore the noise of the Fed and continue to focus on the long term fundamentals driving the precious metals market. Even if they do increase interest rates today, negative real interest rates look set to continue for the foreseeable future. 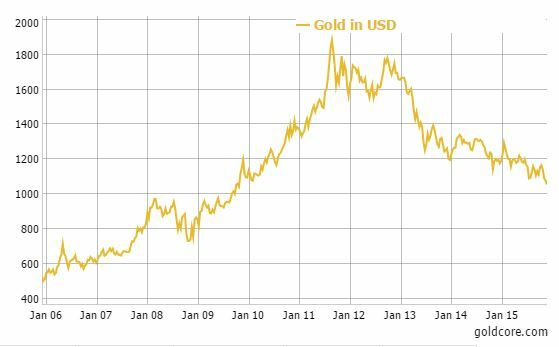 Gold’s long term diversification value and benefits continue to be largely ignored in favour of simplistic analysis and a superficial focus on gold’s nominal price action in solely dollar terms. Short term speculators and weak hands have again been washed out of the futures market due to the recent price weakness and many speculators are now short due to the poor technicals. Prudent investors will continue to gradually accumulate physical bullion on dips like the Chinese. 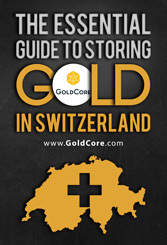 Given the variety of macroeconomic, systemic, geopolitical and monetary risks in the world today, owning gold and silver bullion in the safest vaults in the world has never been more prudent. Today’s Gold Prices: USD 1055.65, EUR 998.20 and GBP 703.05 per ounce. Friday’s Gold Prices: USD 1064.65, EUR 1005.79 and GBP 707.73 per ounce. Gold lost $12.00 on Friday closing at $1058.60, down 1.73% overall for the week. Silver closed at $14.10, down $0.09 which is a 0.56% loss for the week. Platinum continued its slide losing $15 on Friday, closing at $833. Are Silver Prices About to Hit $50? Silver prices may be down, but the precious metal shouldn’t be shunned by investors. 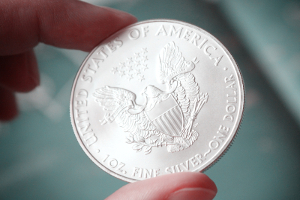 Silver could be presenting a great opportunity for long-term investors. I follow one rule of investing; when not a lot of things make sense, go back to the basic economics of supply and demand. This has never failed me. Looking at silver in this perspective tells me the precious metal could be setting up for a massive price jump. So far this year, the U.S. Mint (up until November 19) sold over 42.9 million ounces of silver in. The post Are Silver Prices About to Hit $50? appeared first on Profit Confidential. Will Next Week Be The Start Of The Crash Of The US Dollar? The year 2015 is coming to an end and we’ve seen a lot this year. 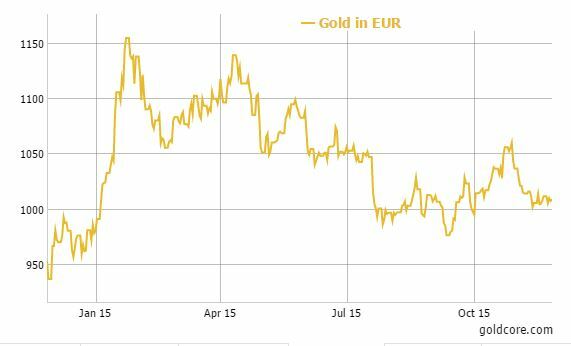 Not only did we see a much stronger dollar, the gold price also weakened despite the dire economic situation in, well, everywhere in the world, terrorist attacks and additional tensions between a NATO member and Russia. Additionally, the Federal Reserve seems to be on track to increase the interest rate before the end of this year. In fact, as you can see on the next chart, gold has now almost reached a 6 year low, but two important indicators are indicating the yellow metal might have been oversold lately. An increased interest rate theoretically means a currency would become even stronger as there would be a higher demand for the US Dollar, especially in the current near-zero interest rate environment all over the world. However, there are additional elements at play here. From Monday on, it’s not unlikely the US Dollar will see its ratio in the Special Drawing Rights basket being reduced in favor of the Chinese Yuan. Earlier this year, China has openly demanded the IMF would include its currency in the basket considering the country’s economy now is one of the largest in the world. There were quite a few people who doubted this would effectively happen, but China has made all the necessary steps as it promised a better market transparency and has even provided an updated status of the total amount of gold on the balance sheet of the Central Bank (and whether or not that’s the true number remains open for discussion. A long discussion.). We expect the IMF to confirm on Monday the Yuan will indeed be included in the SDR basket, and this could weaken the position of the US Dollar around the world. One of the main reasons why the US Dollar gained a lot of strength lately wasn’t because of the ‘strong’ economic situation in the USA, and it wasn’t because the market was anticipating a rate hike. No, the US Dollar was appealing as a world reserve currency because it was worldwide seen as a safe currency but now the Yuan is being accepted by the IMF as part of its Special Drawing Rights basket central banks all over the world might be tempted to convert some US Dollars into Yuan as the Chinese currency will gain a lot more credibility and legitimacy overnight due to the decision of the IMF. Even the chart of the US Dollar Index shows some signs of fatigue. After the most recent run, the Relative Strength Index has almost reached an ‘overbought’ status whilst the MACD is about to make a negative crossover. These two indicators could point in the direction of a weaker US Dollar in the next few weeks. In a previous column at Secular Investor, we already expressed our surprise about some weird trading patterns in the foreign exchange markets, and now the Yuan will probably be added to the SDR basket, we might see some more ‘weird’ swings. Is it time for a ‘Dollar crash’? We wouldn’t be surprised if it is. The US Dollar might have reached the top of its strength and could see a downward correction in the next few weeks. Silver was the best performing precious metal this week with a slight decline of 0.6%. Short sellers apparently did not care if silver traded lower as over 18,000 gold contracts, or $1.9 billion notional, was dumped in overnight markets. James Steel, chief precious metals analyst at HSBC, sees gold’s trading range at $1,025 to $1,275 for 2016, according to a November 24 report. Further 2016 forecasts from Steel include demand exceeding total supply, mine production falling and jewelry demand climbing. The U.S. Mint has sold out of its 2015 one-ounce American Eagle gold coins, according to Bloomberg. In an email statement this week, the Mint confirmed that inventories have been depleted and no additional 2015-dated coins will be produced. According to bullion traders, the purchase of gold jewelry for wedding season demand, along with a firm global trend, contributed to a recovery in the price of the precious metal earlier this week. Silver bounced back a bit as well on increased offtake by industrial units and coin makers. Precious metals funds posted their biggest outflows in almost 17 weeks, according to Bank of America Merrill Lynch, who said investors pulled out $1.0 billion in the four trading sessions to Tuesday. On the flip side, investors continue to pour money into money market funds – a net $12 billion brings the accumulated inflow to a “huge $132 billion in eight weeks,” reported BAML. Palladium was down 2.29 percent and platinum was not far behind with a loss of 2.16 percent for the week. Despite half the platinum mines making losses as the prices dip below $1,000, the PGM’s were the worst performing precious metals this week. China’s net imports of gold from Hong Kong dropped for the first time in four months, according to Bloomberg. Net purchases fell to 87.8 metric tons from 96.6 in September on holiday-shortened October as well as lapsed demand in a “lean season” prior to the New Year. Mauldin Economics says there is one “universal deficiency” in most investors’ portfolios – gold. Calling the metal the “ultimate hedge against any unforeseen crisis,” the group says most professional investors agree that this asset should represent between 3 and 5 percent of a portfolio. They go on to reference Ray Dalio’s portfolio which has a 15-percent allocation to gold and similar assets in 2015, along with Marc Faber’s suggestion in August that investors allocate 10-15 percent to gold. Precious metals bulls want to know why metals prices keep falling despite what appears to be great fundamental reasons for the contrary. 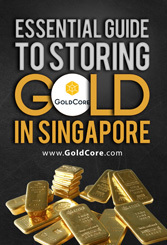 A huge demand for precious metals hidden behind an enormous glut in paper supply could be why, according to Goldseek, who stated that the market has been overwhelmed by an increase in leverage. Referencing a chart in Zerohedge last week, the amount of paper gold has tripled in the past few months relative to registered stocks available for actual delivery. BCA points out that worldwide savings rates point to continued downward pressure on interest rates. In recent years, there has been a trend of increasing investment, especially in emerging economies. However, the pattern appears to be changing, so there is an overabundance of savings as compared to investment. The shift toward lower investment rates in emerging markets may be another downtrend in real interest rates, despite the possibility of nominal interest rates increasing on December 16. Lower real interest rates should be supportive of gold prices despite the lift in nominal rates. Goldman Sachs believes the U.S. could see four interest rate hikes by the Federal Reserve next year. The central bank is expected to raise the short-term Fed funds in December, and according to a Bloomberg article, Goldman predicts the U.S. will continue to grow fast enough to spur the Fed to raise rates by an average of once a quarter. Hedge funds don’t believe that gold’s decline is over and money managers are holding their first net-short position in the precious metal since August. Talk of the U.S. raising borrowing costs for the first time since 2006 are leading investors to flee the asset class, according to Bloomberg. Assets in exchange-traded products backed by gold have reached their lowest since 2009. Gold dropped to its lowest level since February 2010, as a looming U.S. interest rate hike in December has curbed the metal’s appeal. Fed funds rate data shows that the probability of an interest rate increase rose to 74 percent on Friday from 72 percent the day prior. Christine Lagarde and the IMF Executive Board recently announced their intention to include the Chinese renminbi (RMB) in the Special Drawing Rights’ (SDR) valuation formula. This would bring the Chinese currency into an exclusive group – alongside the US dollar, the euro, the British pound and the Japanese yen – of 5 global currencies that make up the IMF’s own reserve currency. So, what will this promotion really mean for the yuan? In market terms, not a whole lot it would seem. 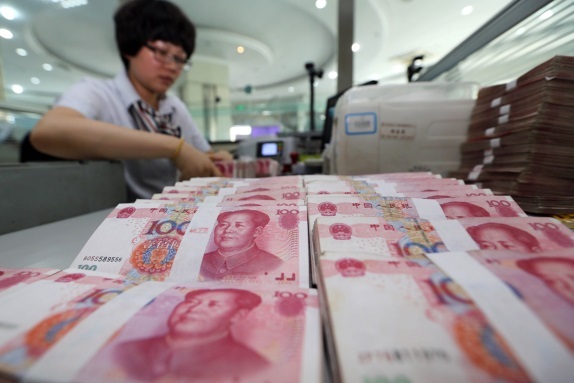 The inclusion of the RMB in the SDR basket will not significantly increase demand for the currency. It is simply an acknowledgment that the Chinese currency has fulfilled two of the IMF criteria for inclusion; that it was “widely used” and that it was “freely usable”. “It is clearly a symbolic victory in China’s efforts to raise its status in the international financial community, commensurate with its growing importance in the global economy”. It should be noted that inclusion in the SDR is very different from increasing China’s share in the IMF quota, which has also long been pending. The IMF’s quota represents the member country’s voice in the decision making at the IMF and is closely linked to the country’s influence over the IMF. If approved, as expected, at a November 30 board meeting, it would mark the first significant change to the IMF’s “Special Drawing Rights” (SDR) basket since the inclusion of the euro at its creation in 1999. In a statement, the People’s Bank of China thanked the IMF for the recommendation and said it was “an acknowledgment of the progress in China’s recent economic development, reform and opening up”. Today’s Gold Prices: USD 1064.65, EUR 1005.79 and GBP 707.73 per ounce. Yesterday’s Gold Prices: USD 1070.50, EUR 1009.41 and GBP 710.30 per ounce. US markets were closed yesterday due to the Thanksgiving holiday. Precious metals have been amongst the worst performing investments this year. Both gold and silver prices seem to have landed in a downward spiral. The question: will silver prices rebound as we step into the New Year or just continue hitting new bottoms? In times like these, it’s always good to take advice from an expert. For investment advice, I look no further than the respected investment maven and self-made billionaire Warren Buffett. Buffett’s investing principles are simple: invest in something that. 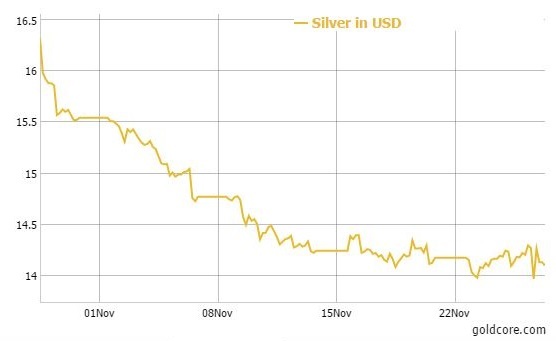 The post Silver Prices: This Could Cause “Super Spike” in Silver Prices appeared first on Profit Confidential. The abuse of power is staggering. Time and time again over the last number of years the largest global banks have been found complicit in the manipulation of key rates, indices and markets. Now, a large and important pension fund has taken the largest of banks to task and filed a class action lawsuit alleging conspiracy to thwart competition and extract large fees and margins from the vast and critical interest rate swap market. The banks “have been able to extract billions of dollars in monopoly rents, year after year, from the class members in this case,” the suit states. 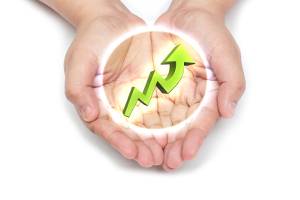 Interest rates swaps are used by companies and investors alike to manage interest rate risk. It is critical in smoothing returns and removing interest rate sensitivity. Providing an efficient trading market is lucrative, but when managers of that market collude to keep margins elevated at the cost of market participants, then we all suffer. The lawsuit goes on to state that banks had “jointly threatened, boycotted, coerced, and otherwise eliminated any entity or practice that had the potential to bring exchange trading to buyside investors.” This policy had one purpose, “to preserve an extraordinary profit centre,” the lawsuit said. 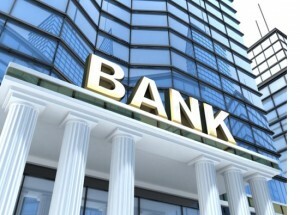 It is alleged that the banks disguised their collusion by using code names for projects such as “Lily”, “Fusion,” and our favourite, “Valkyrie,” according to the suit. Typically, what will happen now, should the suit be successful, we will see a regulatory investigation by the authorities in the U.S. and Europe, with massive fee generation for all the professional classes concerned and associated with prosecuting, defending, and interpreting the situation. A big fine will be handed down and paid to the regulators, (note: not the victims), by the perpetrators. No executives will be found guilty, no liability made nor conceded. Shareholders of the banks will barely take notice and the public, who have been paying the price for this collusion, will get back to the task of not giving a damn. Sure, they would be happier watching box sets. They say people get the governments they deserve; well, they get the institutions and regulators they deserve, too. Apathy is the greatest destroyer of liberty. “Someone should do something,” I hear you say, well, you are someone, so get mad. Today’s Gold Prices: USD 1070.50, EUR 1009.41 and GBP 710.30 per ounce. Yesterday’s Gold Prices: USD 1072.20, EUR 1011.10 and GBP 711.23 per ounce. Gold lost $4.80 at the end of the day yesterday to close at $11.70.60. Silver gained $0.02 for the day to finish at $14.19. Platinum managed a gain, closing up $1.50 to $840.50.